As the Winter comes to a close and the light of Spring is at the end of the tunnel, it’s a good time to check in with how you’re feeling. Were you as active as you’d like this Winter? Have you noticed chronic muscle pain? We’re all familiar with “Spring cleaning”. A fresh start. A time for renewal. Your body deserves the same courtesy. There are many ways to treat chronic pain. From Ottawa Massage Therapy to custom orthotics, depending on your individual needs. Many just get used to their daily pain medication to mask that pain. If you’re someone who experiences chronic muscle pain, Intramuscular Stimulation (IMS) may be beneficial to you. IMS is a form of acupuncture that was developed by a Canadian, Dr. Chan Gunn, in the 70’s. Dr. Gunn was awarded the Order of British Columbia as well as the Order of Canada for his work towards solving chronic pain. IMS is an effective treatment for neuropathic pain. Although IMS would appear to be similar to traditional acupuncture Orleans, the acupuncture needles used are very thin. You may not even feel it penetrating the skin, and if your muscle is normal, the needle is painless. However, if your muscle is sensitive and shortened, you’ll feel a unique sensation – like a muscle cramp. This is a specific type of sensation caused by the muscle grasping the needles. Usually, patients learn to recognize and welcome this sensation. The term “no pain, no gain” applies here as shortly after that sensation of slight pain, patients tend to feel an amazing sense of relief and the muscle is no longer tight. Patients then look forward to that initial sensation as they know the treatment is working and relief will be just around the corner. The amount of treatments needed varies based on each case. In terms of frequency, typically, once a week is enough. In some cases, only one treatment is ever needed. Lower back pain sufferers, for example. typically receive between 8 and 9 treatments on average. Many IMS patients have been pain free for 20years after their treatments! 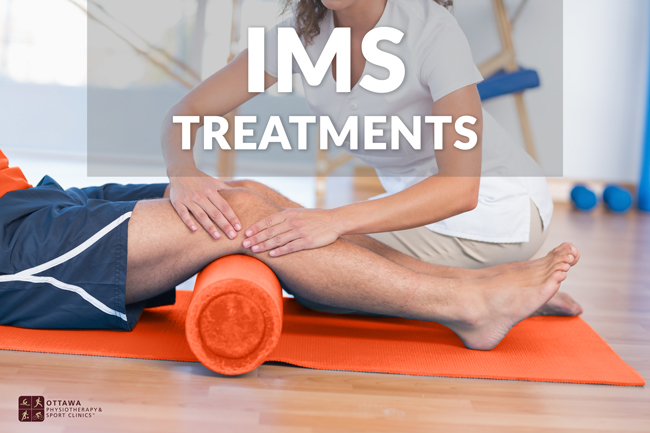 If you’re interested in more information on IMS or to see if this type of treatment would be right for you, please contact us in WESTBORO, ORLEANS or BARRHAVEN. IMS treatments run at $70/hr.